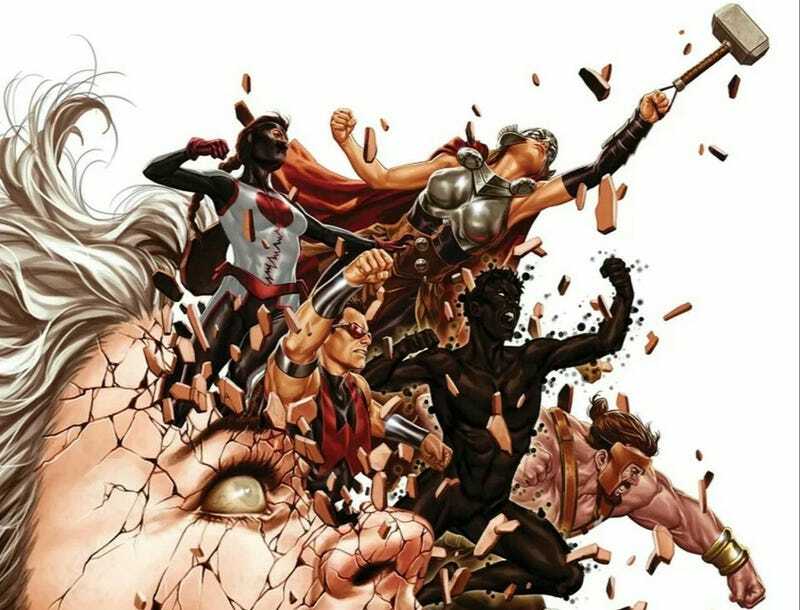 Avengers: No Surrender is a sixteen-issue weekly storyline that goes from Avengers #675 to Avengers #690, combining all three separate Avengers teams (the main Avengers, the U.S. Avengers, and the Avengers United Squad or “Uncanny Avengers”) together, along with the writers of all three books (Mark Waid, Al Ewing, and Jim Zub), in order to make a story that will provide a epic enough conclusion for this era of the Marvel Universe. So far, it has been action packed, but the latest issue also gave us a good reason why this is the perfect story for the end of one era and the beginning of another. The main conflict of No Surrender is pretty simple: the Grandmaster and another Elder of the Universe, the Challenger, have set up a game and Earth is the game board. Both sides have chosen their champions (the Challenger resurrected the Black Order, while the Grandmaster put together a new Lethal Legion) and froze almost everyone on Earth, aside from a few Avengers, who would serve as obstacles in the way of each team finding and capturing four “Pyramoids.” The Elder who wins the game wins the name of “Grandmaster” and the loser is banished outside of the universe forever. Oh and Earth is still probably doomed. But this premise is just the cover for the real meat of the story: an exploration of the characters in the Avengers, their personalities and backstories, their flaws and foibles as they try (and often fail) to stop what’s going on. Each issue is narrated by a different character and each issue gives a different perspective. And the introduction of “Voyager,” one of the original Avengers who was apparently forgotten by the world, ties the whole thing into the team’s origin. “Voyager” wasn’t an original Avenger at all, but the daughter of the Grandmaster who had seeded herself into their memories in order to become an ace in the hole for her father. But the Challenger had his own ace, in the form of a newly resurrected Hulk. You might say “Well, of course they resurrected Hulk, they always bring back dead characters.” And yes, they did just bring back Black Widow (or a clone of Black Widow), too, but the Hulk’s resurrection was different. It’s been shown, time and again, that the Hulk will come back from nearly everything. And now he came back from death...a little too easily. And Bruce Banner, trapped in the Hulk’s mind, understands: the Hulk is immortal. Even death cannot stop him. And after the Hulk rips through the Avengers and nearly causes the Challenger to win, Bruce has to accept that fact, accept the fact that the thing within him can’t die. And in a moment of quiet, a lull between the action, he has a chat with Edwin Jarvis, the Avengers’ loyal butler. And that is why No Surrender works so wonderfully: because it takes the time to show what each character is made of, their inner conflicts and struggles. It knows when to explore the past, but also when to open up the future (quite literally in this case, as Al Ewing will be writing the horror-tinged Immortal Hulk for Marvel’s “Fresh Start” and I can’t wait).